It doesn’t take a sick day for SJ to want to sleep in my bed. It also doesn’t take much convincing to get him to sleep in his own bed. But sometimes, I don’t even try to convince him. Ms. MMK. says it’s because I can sleep through anything. But she’s wrong. Well, not completely. There have been times when I didn’t realize the children had snuck into our bed till the next morning. However, SJ is old enough and big enough where his presence is felt. The reason I don’t mind SJ sleeping in my bed is because I know this too shall pass. A couple of years ago, I wrote a post about a night where my kids were coming in and out of my bed. Both of them were going through a phase for a couple of weeks, and it was a rough stretch. You’ve been there. You know what I mean. That week a mother I know approached me. She told me she had read the post and liked it. She also told me that one day I’ll miss the kids coming into my bed. She had a wistful look in her eye and sighed audibly. Her youngest was already in high school. I tried to “yeah but” her before finally listening and realizing that she might be right. I know SJ’s request to sleep in my bed won’t go on forever. Like milk, it has an expiration date. Yet unlike milk, I don’t know when that date is. There is no preparing for it. It will be imperceptible. It will tweeter out and then be done. It will be the sun setting. One moment it’s above the horizon and the next it’s gone. And no matter how much I miss it or want it back, there will be no encore. This is how phases go with children. I’ve seen enough already to realize it. Sometimes even talking about the old phase is a no no. SJ goes crazy if we even mention how much he loved Thomas The Tank Engine. I think sleeping in my bed will fall into that category. Can you imagine how embarrassed SJ would be if I mentioned it as his Bar Mitzvah? Or if I shared it with the first girl he brings home? Or with his college buddies when they crash at our place? No, once this phase is over it will have to be put aside in all forms. I probably won’t be able to talk about it again without SJ grumbling till he has children of his own. Maybe I’ll laugh about it with him when he tells me his children are sleeping in his bed. Or maybe I’ll tell my grandchildren (feels funny to write that) about how their dad used to sleep in my bed. As he grows older, his needs from me will change. For now, there are nights when he feels more safe and comfortable in my bed. On those nights, I’m happy to move over and share a safe and comfortable place. This entry was posted in Family and tagged bed, Children, family, sleep by lardavbern. Bookmark the permalink. Good point. 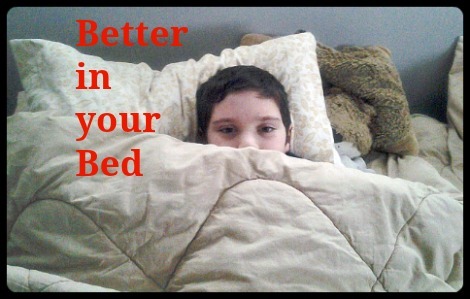 Unfortunately, our kids never sleep in our bed. We set them up from birth to sleep in their own beds, and that is what they know. They do come in for snuggles, but not to sleep. I wouldn’t mind that every now and then, but Mrs. L insists no sleep would actually be had. The snuggles are better than the actual sleep – they always seem to sprout and every bed seems too small. Those days go far too quickly. There are a lot of things the kids used to ask me to help them with that, now that they are older, I realize I miss. You are smart to realize there is no preparing for when they stop doing certain things! I’m sure I could come up with a list too. What would be on yours? So sweet! Eric and I only have a full size bed (and two very tall kids), so our days of sleeping next to the children have long since expired. Now if they’re sick we move to the basement living room, which has two couches. It’s not quite the same, but it works pretty well. Ah yes, certainly an expiration date on this one (as there should be), but it’s bittersweet to be sure. I miss those weekend mornings of the boys running down to jump in our bed. At least we have our memories. Still creating those memories here. I hear you. Hopefully, you at least get a hug. I so know what you mean, I have actually started enjoying having a snuggle on the sofa with Jacob when he has a bad night because like you said, it won’t last and whilst it does you’d better enjoy it!